WOULD YOU BELIEVE... Two Buffs serendipitously ended up on the same transatlantic cruise in April. 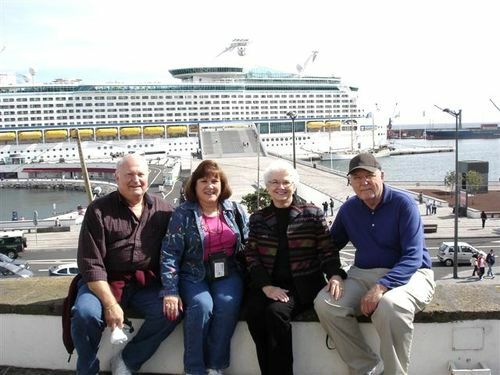 Left to right - Donald and Susan Hannsz, Kay (Burg) and Joe Moseley with their cruise ship in the background. Kay reports that they met up on the steps of a lovely old church in the Azores - 800 miles off the coast of Portugal. They ran into each other again at Blarney Castle in Ireland.